“The Extreme-Weather Drone” can withstand a tropical storm with heavy rain and wind gusts up to 50 mph. It can also play a vital role for first responders. This versatile new technology has the potential to become one of the highlights of our drone fleet and took a big step forward with a successful first public flight in Bedminster, New Jersey last week during an NDR capabilities demonstration. 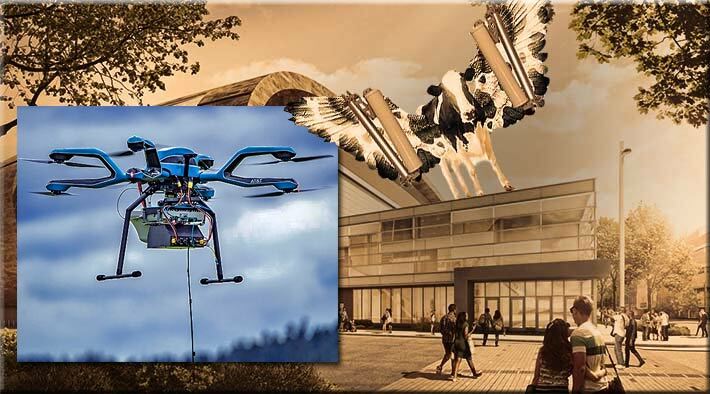 The all-weather Flying COW also took flight earlier this week in Redmond, Washington when engineering students at the University of Washington used it to test LTE antennas they designed to connect on our drones. The antenna development and test flight was the capstone project for students, and also the first time the new all-weather Flying COW took on live LTE test traffic. Compared to our traditional Flying COW, this weather-hardened version with beefed up hardware, rugged features and enhanced capabilities is equipped for a more robust role in extreme environments. 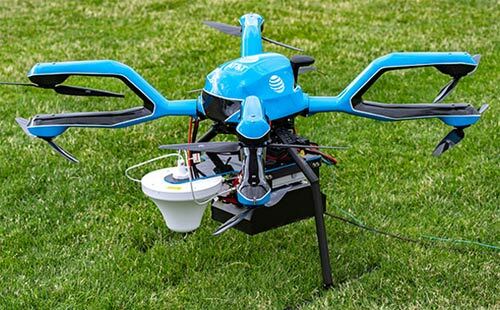 Equipped with small cells and antennas and easily transported, deployed and moved quickly to accommodate rapidly changing conditions in an emergency, the “extreme-weather” drone can also withstand a tropical storm with heavy rain and wind gusts up to 50 mph. Plus, it can fly in snow and extreme temperatures ranging from below freezing to sweltering heat. It also has the capability to see through smoke, tree cover, and other obstacles. While invaluable to our network recovery work, this new technology can also play a vital role in equipping first responders across the country. Built by AT&T in public-private partnership with the First Responder Network Authority, FirstNet gives first responders’ communications capabilities a major boost, providing a reliable, highly secure and always-on connection. With that responsibility, we’re committed to empowering first responders with the next generation of communications tools. And our all-weather drone is one of the ways we’re delivering. Think about first responders operating in remote locations, battling a rapidly moving wildfire that has charred the infrastructure they need to communicate. Or search and rescue crews whose mission takes them off the beaten path where a network doesn’t exist. The all-weather Flying COW has the capability to hover above harsh conditions and remote terrain to keep them connected when other drone and deployable options aren’t viable. Plus, with its thermal imaging capabilities, the all-weather drone can “see” through certain types of roofs to guide fire fighters around burning trusses, helping them to avoid stepping in areas that may be ready to collapse. This capability can also help search and rescue teams locate people trapped between collapsed buildings following an earthquake or lost hikers hidden from view under dense tree cover. Between its durability and imaging capabilities, the uses of our all-weather drone are endless for fire, police and search and rescue. And we’re thrilled to provide this life-saving technology for them. As hurricane season quickly approaches, we monitor the high winds, high waters and other catastrophic events. This year we’ll be especially well prepared with this innovative new tool in our arsenal. We’ll have our new all-weather Flying COW ready to deploy when and where it’s needed. Not just to restore our critical connections, but also to help first responders on their mission to save lives and restore communities. As Unmanned Aircraft Systems (UAS) Program Director for AT&T, Art Pregler is responsible for nationwide oversight and internal implementation of drones. 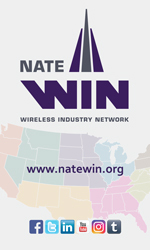 He is also Director of National Mobility Systems, responsible for development of enterprise data systems. Prior to AT&T, Art served DOD, NASA, DARPA, and other technology-focused agencies as a Command & Control Officer, Air Traffic Controller, Air Weapons Controller, and Mission Control Specialist. He’s supported Space Shuttle flight operations, Strategic Defense Initiative (SDI/Star Wars) systems testing, and electronic warfare systems development. He directed live-fire flight tests against QF-100 and QF-102 drones, and he supported development of Global Hawk and Dark Star surveillance drones. Art was a member of the FAA’s 2016 UAS Aviation Rule-Making Committee (ARC).